Powdery mildew, and downy mildew are very common world wide fungal diseases that affect both field grown crops, as well as hydroponic and greenhouse grown crops. They are easily recognized plant diseases, but are often confused with each other because they can often look similar (especially in the early stages). But they are different diseases that thrive in different environmental conditions, making that the easiest way to tell them apart. But like any fungus, they are easily spread through spores that travel through the air, and can affect virtually any and all types of plants. Although powdery mildew is more common than downy mildew, they both can stunt plant growth, yields, and even the quality of the yield. Powdery mildew generally appears as a dusty white or light gray “talcum powder like” growth over the plants surface. It’s usually seen on the leaves, but can easily grow on the stems, flowers, and fruit as well. It can sometimes mistakenly be dismissed as just dust that has accumulated on the plants surfaces. Spores land on the plant through the air, and when conditions are right they germinate. They begin as tiny pinhead sized spots, either as a single spot, or in groups. These spots grow larger, and grow together into a continuous layer as the mildew grows. 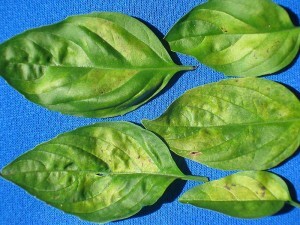 Powdery mildews can cause stunted and distorted leaves, as well as stunted and/or distorted fruits. The fungus feeds directly on the nutrients in the plant tissue. It causes yellowing/discoloration of the leaves, and causes them to die and/or drop off prematurely. In general it causes an overall decline in plant growth, as well as plant health. The severeness of the disease depends on several factors. Like type of plant, how old the plant is, how healthy the plant is to begin with, as well as the weather conditions while the fungal disease is infecting the plant. (1) Powdery mildew usually shows up later in the growing season, but can occur at any time if the year if conditions are right, like especially in greenhouse conditions. (2) The severity of the disease depends on many factors like variety of the host plant, age and condition of the plant, and weather conditions during the growing season, Especially if conditions are most favorable like when growing inside. 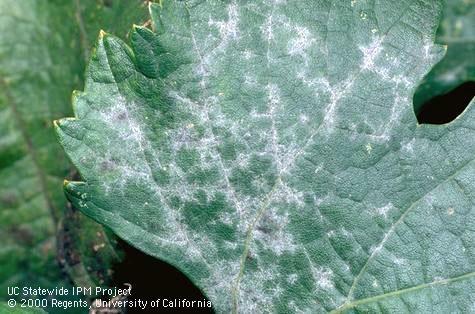 (3) Powdery mildew is more common on the tops of the leaves, but can also appear on the undersides of leaves, as well as on the buds and fruit. (4) Powdery mildew is likely to be severe in warm dry climates, that’s because it doesn’t need water on the plant, in order to be able to infect the plant. However it does need high humidity for the spores to be able to germinate. Like areas where plants are spaced closely together, shaded damp areas, or areas that have dense foliage. Basically damp areas with poor air circulation around the plant. Once the spores are germinated, the fungus infects the plant, and can continue to easily spread in the warm dry climate. (5) The young succulent plant growth is much more vulnerable to the fungus than the older plant growth (where downy mildew usually affects older growth first). (6) Powdery mildew is a fungus, and like mushrooms, there are a number of strains of powdery mildew as well. Each strain can only live off of certain types of plants. So the right spores need to make their way to the right spot, on the right type of plants, in order to be able to cause infection. In some cases it may be possible to find resistant varieties of the plants your growing in your area, and that can be a great start to minimizing damage in the first place. However if it becomes a significant problem, there are some things you can do. (1) Prune off the older growth, especially for crowded plants. This helps air circulation around the plants, and helps prevent the spores from germinating, and being able to infect the plant at all. (2) Prune off infected plant tissue. 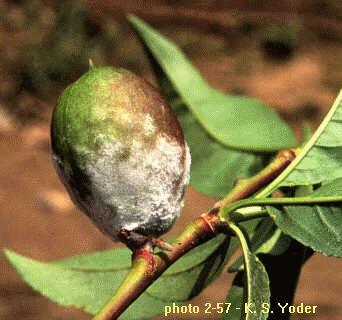 That keeps the fungus from feeding on the plant, as well as to help prevent the fungus from spreading to new areas. Do not compost infected plant debris, or the fungus will still grow, and/or spread it’s spores in your area. (3) Avoid overhead watering and misting the plant foliage. This helps cut down on pockets of moisture/humidity in and around the plant foliage that the spores need to germinate. (4) If the infestation continues, you may want to consider using a chemical and/or fungicide spray. Ask at your local nursery about them. Some like NEEM oil are organic. Another remedy that may be effective is baking soda mixed with a horticultural oil like NEEM oil, or a sticky foliar fertilization agent. Recommended mix is about 1 tablespoon baking soda to 1 gallon of water, plus the horticultural oil (according to manufactures instructions). 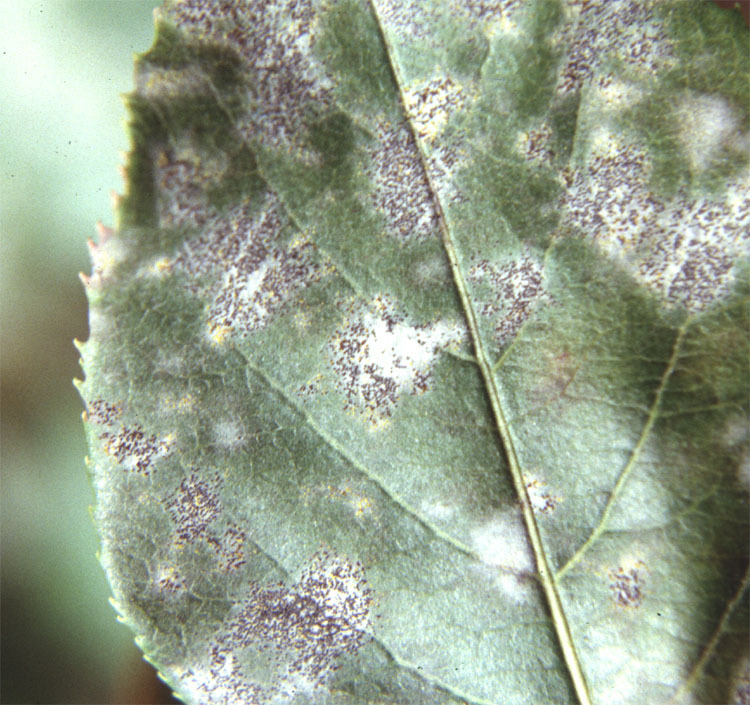 The first sign of downy mildew is often the appearance of light green or yellow spots on the tops of the leaf surface on the older leaves. A closer look shows the spore growing fungus/mildew on the underneath the same leaves. 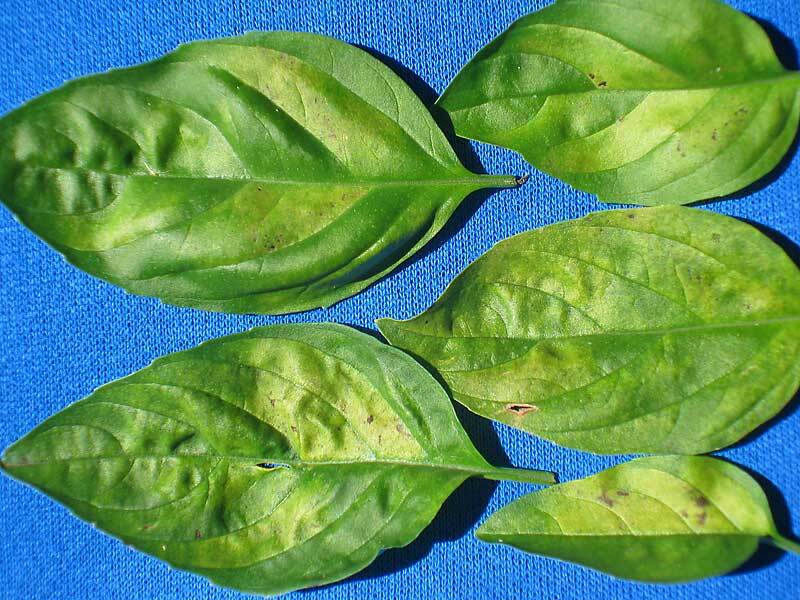 Downy mildew will causes plant health to quickly decline, and with stunted plant and fruit growth, as well as poor flavor. You may even see leaf curling, and infected leaved die and fall off quickly. 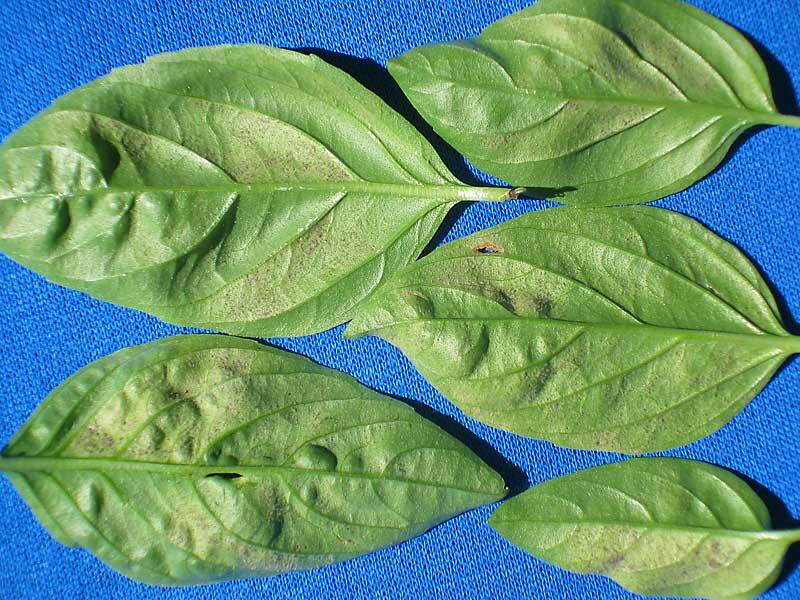 Downy mildew may even be confused with nutrient deficiencies, or look similar to damage done from foliar nematodes. But it’s a soft fluffy light gray to brown, or even purplish mold that grows on the undersides of the leaves. 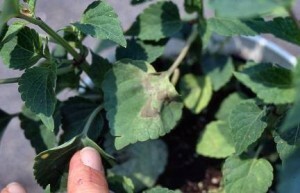 Downy mildew is closely related to the Pythium, a water mold that causes root rot. Except downy mildew infects the plant foliage, and not the roots. As the infection grows, it feeds on the plant tissue. Where noticeable blotches of dead or dying plant tissue can be seen ranging in color from simply off-color, to yellow or brown patches, to purplish patches, and even dark purple to black patches depending upon the host plant. These off-color spots are sometimes confused with nutrient deficiencies, so you’ll want to look at the underside of the leaves for the fungus if you see spotting. (1) Downy mildew prefers cool, moist conditions. 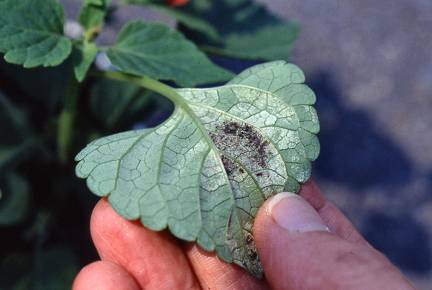 (2) Unlike powdery mildew, downy mildew requires a film of water to be able to infect the plant. (3) Older leaves are usually affected first, and spread to the younger leaves. (4) Spot on the top leaf surface are typically brighter than on the bottom leaf surface, and may remain yellow, turn brown or purplish. (5) The undersides of the leaf surfaces are covered with a layer of fungus that can be white to gray, or even purplish and almost black. (6) Spots on the upper leaf surfaces are sometimes bounded by the veins in the leaves. (7) Downey mildew doesn’t usually infect the fruit itself, but fruit like melons can easily become covered with the fungus. (1) Use resistant varieties if possible. (2) Keep relative humidity below 85%, and don’t allow standing water on the leaves. Reduce any splashing water on the foliage, and/or overhead irrigation or misting to reduce the chances of infection. (3) Promote good air circulation to help prevent damp foliage. (4) Avoid spacing plants to closely together to help promote good air circulation between plants. (5) In some cases using blue polyethylene sheets to filter light has seemed to be able to reduce spore production/infection, though may reduce yields. (6) In some cases it may be necessary to use a fungicide. Consult with your local nursery on what they recommend. There are even some common organic fungicides like NEEM oil you can use.